Jesus went on: “Does anyone bring a lamp home and put it under a washtub or beneath the bed? Don’t you put it up on a table or on the mantel? We’re not keeping secrets, we’re telling them; we’re not hiding things, we’re bringing them out into the open. We sing the carols. We see the family. We buy the gifts. We send the cards. We say Happy Holidays to everyone we meet. We make special dinners. We decorate the tree. We string popcorn. We light the candle wrap the presents. We frost dozens of cookies. We stock the stockings. We tell the stories. We attend church. Does this make it really Christmas or does it just appear to be? We argue about what to buy. We complain about the tree size. We get mad at the cat. We often go broke. We ignore other financial obligations. We are tired. We are weary. We go above our normal routine just to get the perfect gift. We eat too many cookies. We dread seeing family. We hate cranberry sauce. We’d rather eat the popcorn. We go to church because grandma said so. We dread pretending to be happy. We are disappointed with our gifts. We never seem to get what we really wanted. Do we really even get what Christmas is? What does it really mean to you? Christmas is a holiday to most of us that really can either stretch or stress us. So many people out there are just trying to get by, that when Christmas comes they lose all hope in God at all. I know families out there who will not have much of a Christmas but I believe God will show up. I believe we have a loving God who will take care of us according to His will if we are willing to seek Him. Jesus came to save this world from sin. Sin causes pain. If He came to save us from sin then He also came to save us from pain. For so many the holidays are just filled with pain, not joy. The NIV version of the Bible mentions joy 244 times. To me that means it’s pretty important to God that we find joy. This year for me even though I am happy in life, Christmas just does not have the same meaning as it used to. It seems to have lost its joy. We have not even put up a tree yet and usually that goes up the minute Thanksgiving is over with. Not sure what is going on in my heart with this but I am seeking God for answers. This Christmas I urge us all to really look at that day and explain to ourselves why we celebrate? What we celebrate? How we celebrate? Who are we celebrating? 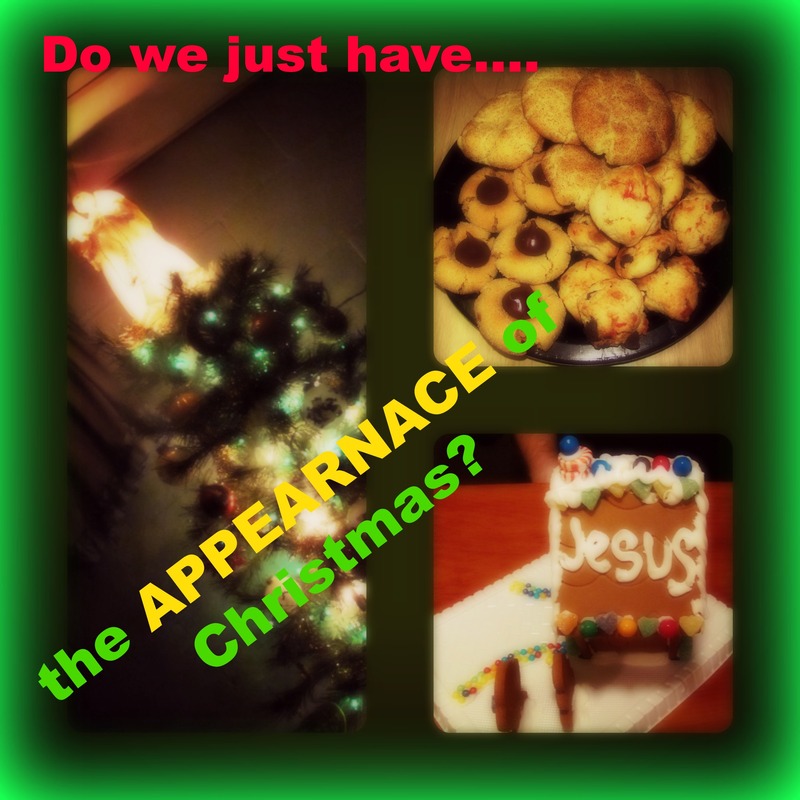 If Jesus is not the answer then we have an appearance of Christmas. We need to begin to seek the face of God and ask Him to show us Christmas so that we can start to tell others what it really means.